Shaft collars and couplings are used in a wide variety of applications, industries and work environments. A shaft collar is most commonly used to secure a component onto a shaft using a collar, although hundreds of other uses have been documented. The most popular types of collars include metric shaft collars, split shaft collars, stainless steel shaft collars and solid shaft collars. Popular finishes include: aluminum, black oxide, unplated, zinc and stainless steel. Shaft couplings are used to hold two shafts together. 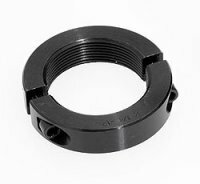 NutsandBolts.com offers shaft couplings with or without keyways in a variety of finishes.